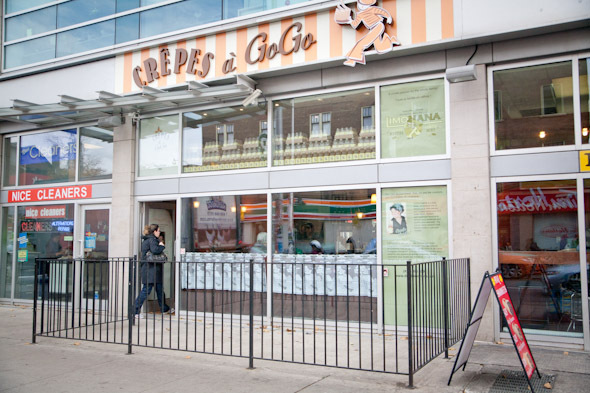 Crepes a GoGo made its return to the Annex last week at Spadina and Bloor, a long awaited move since the restaurant shuttered its Bedford and Bloor location in 2002. Forced out of their original address to make way for condo development, owner Chef Veronique moved her establishment a couple subway stops to the east and set up shop in Yorkville where Crepes a GoGo has garnered a loyal following. But it's back in its old hood and after only a few days has a line out the door during the lunch rush. 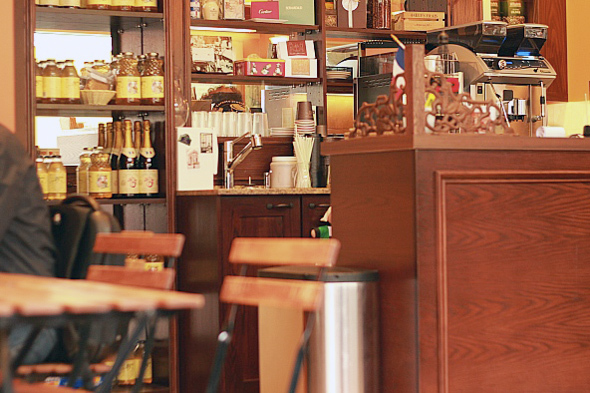 But customers should take the "GoGo" portion of the name to heart because if you're not grabbing food on the run you may have trouble finding a seat among the three little tables and the small row of bar stools along the window. The entire staff seems to be French, casually chit chatting to each other en Francais and calling out "Bon Appetit!" before handing each person their order. The French servers, the menu and the vibe are all built in the same image as the Yorkville location. It seems Veronique found a formula that works and she's sticking to it. My friend orders the Cotes D'Azur, already a favourite with Crepes a GoGo's Yorkville regulars. Served warm and stuffed with goats cheese, tomato and basil and sprinkled with a little olive oil ($8.50), this dish is French simplicity. Warming and softening the cheese and tomatoes, without quite cooking them through, takes the Cotes D'Azur from lunchtime sandwich to soothing comfort food. 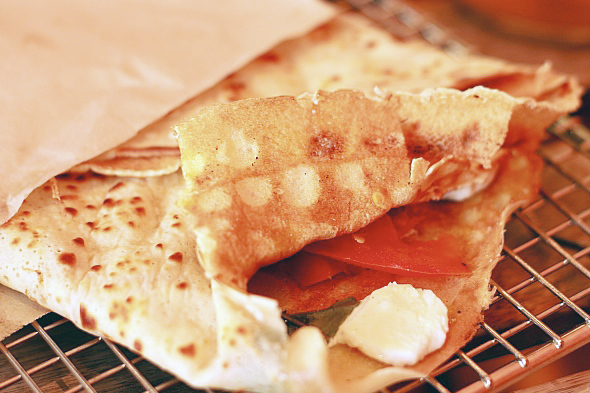 I choose the Crepe Madame, filled with cream cheese, smoked salmon, dill, red onion and a splash of lemon ($10), rolled up like a wrap and served a little cooler than the folded crepes. Pairing creamy and smoky flavours with the zesty punch of lemon and dill made for a refreshing and light lunch. In fairness, it's difficult to screw up cream cheese and lox, but the ingredients are perfectly fresh and the presentation is simple and elegant. Once we finish the savoury, it's on to the sweet! 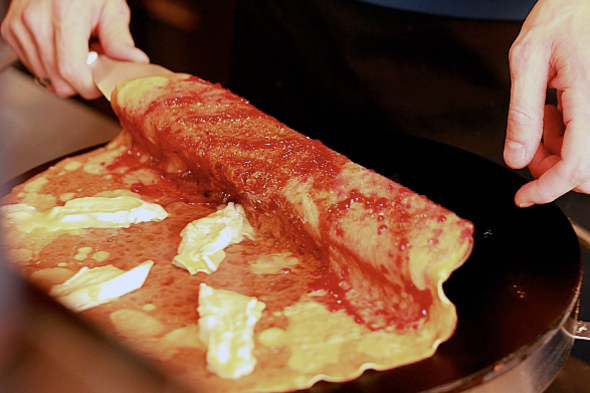 We choose one of their signature crepes, the Big Ben, filled with raspberry jam and either mozzarella or brie. We choose brie without hesitation. But having already downed two different cheeses in the first round of crepes, the dessert makes for a bit of cheese overload. Even for a pair of cheese enthusiasts like ourselves it's still a bit much, so consider yourselves warned. 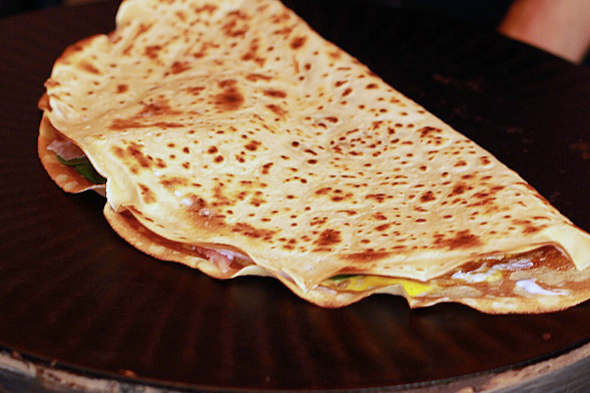 There are the crepes restaurants that try to cram as many toppings in as possible as though they are serving up a burrito, and then there's the more delicate approach to crepes, an experiment in subtle flavour combinations. 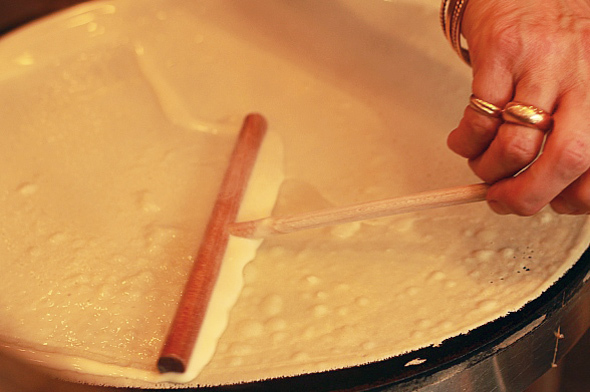 Crepes a GoGo is the latter. The toppings are fresh and the batter is supple. 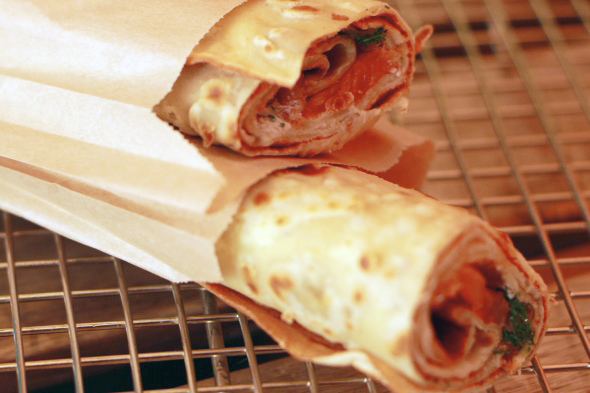 Great batter is to the crepe what great dough is to pizza - it can make or break it, no matter how great the toppings. But in this instance the whole package works. Bon Appetit, Annex!